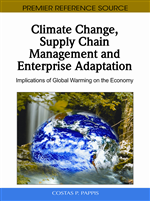 In the previous chapter the focus has been on issues concerning adaptation to climate change. Key adaptation concepts and policies were introduced and potential adaptation responses in the case of developed and developing parts of the world were summarized. Also, several incentives encouraging or barriers preventing adaptation were identified and the economic framework for adaptation was outlined. Greenhouse-gas concentrations in the atmosphere now stand at around 430ppm CO2 e, compared with only 280ppm before the Industrial Revolution. The stock is rising, driven by increasing emissions from human activities, including energy generation and land-use change.